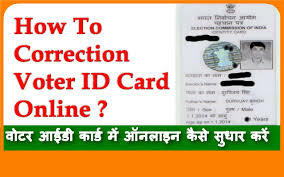 Voter Id Card is an important document, before the 2019 Lok Sabha elections, Madhya Pradesh, Rajasthan, Chhattisgarh, Mizoram, and Telangana assembly elections are to be held later this year. If you want to change the picture in your voter ID card before the election, today we will give you information about some important steps. By following these steps you can easily change your picture sitting at home. Before changing the picture, you must have a new passport size photograph. Step 1: First, go to National Voter Service Portal www.nvsp.in. Step 2: On the homepage, you will see the option of Correction of entries in the electoral roll below in the voter's list. Step 3: After clicking on the improvements in the entries in the voter's list, the format 8 form will open in front of you. If you want to change the form of the form then click on the Select language option on the top right. Here you will find three walls of the language- Hindi, English, and Malayalam. Step 4: After this, choose your state and assembly / parliamentary constituency. Step 5: Enter the information sought for in the form. Note that it is compulsory to fill out any option that appears as '*' in front of you. Step 6: There is a box on d / e number, here you have to click on 'My Photo' / My Photograph. Step 7: After this, you have to select the photo by clicking Browse at the bottom. After selecting the photo, upload it. Step 8: Enter the email and mobile number after uploading the photo. Step 9: After entering all the information, insert the Captcha code and click the submit button. Step 10: After submitting the form, the reference number will appear on the screen. Note this number somewhere, let us know that with the help of this number you can easily check the application status. It can take approximately 30 days for the application process to be completed and the new ID card is issued.